I've have been filtering my drinking water with Zero Water for over a month and the experience is something I'd highly recommend to others. I ended up purchasing the 6-Cup Zero Water Pitcher from Bed Bath and Beyond after considering other options such as the Brita or Berkey. The main reason for purchasing a filtration device is to stop buying bottled water, which is both resource intensive and pollutes landfills with lots of plastic bottles. On the other hand, I don't trust regular tap water to be clean enough for consumption. After my research, I believe that the Berkey system could effectively clear out most of the water. Just look up the term Berkey on YouTube and you'll find tons of reviews and stories. However, a high upfront cost paired with large and non-portable until was a deal breaker. Brita on the other hand is everywhere, and therefore very affordable (when it comes to replacing filters). But after some quick research, I found that Brita's are not very effective at filtering out contaminants in the water. Instead, Brita's main focus is to improve the taste of the water. This for me was not enough. Zero Water on the other hand comes in a portable pitcher (though I don't like the fact it's a plastic pitcher). The filter is very advanced, filtering out all the contaminants in the water, hence the name 'Zero Water'. The selling point here was a YouTube video 'What happens when you pour wine in a Zero Water Pitcher?'. Even though the result was a slight hint of red, they claim it tasted like pure water. Additionally, the 6-Cup Pitcher comes with portable laboratory-grade water testing meter to check your tap water and to determine the right time to replace the filter. The first thing I did when I got home with my Zero Water Pitcher was to use water testing meter to test the tap water in my neighborhood. Note that every neighborhood may be different, and these results are specific to Millbrae, California. The side handle is wide and strong enough to support a pitcher full of water. This is important, as after dinner, I'll often bring a pitcher full of water upstairs to enjoy so I don't have to keep going up and down the stairs. The size of the pitcher is just a bit too large to fit in my refrigerator, without adjusting the layers. For me, this isn't a problem because I prefer room temperature water. There is an available spout at the bottom. Unfortunately, as read in many reviews, the spout on the 6-Cup Zero Water Pitcher is poorly designed and with extended use will begin to leak. And since the spout is at the bottom, a leaky spout essentially "breaks" your pitcher. The pitcher is plastic, so when water sits for a duration of time, I begin to taste a plastic-like flavor. To be safe, I don't leave water in the pitcher for more than a day. To be safe, I dump out the water. The filter is very easy to install. It simply screws on with a few twists, and the pitcher is good to go. Zero Water filters are more expensive than Brita filters, but in my opinion also filter out much more, so the price justifies the product. The filter 'drips' the water through, so it does take time. If you need a lot of clean water, you may need to plan ahead. But from what I can tell, the wait time is usually fine. The one minor annoyance is that the lid is not tight enough to begin pouring before all the water is filtered. Again, this is minor. Most of all, I like that there is a condition for when the filter requires changing, and that is when the water tester meter reads 6. This gives me a higher confidence that the filter is truly "done", especially when compared to Brita filters which are changed on a time basis. How Many Gallons of Water Can Zero Water Filter? A common question to determine if purchasing a Zero Water filter is worth the money is to know how much water one filter can process before it needs to be replaced? According to the information on the Zero Water website, the number of gallons is based on Total Dissolved Solids in your tap water. 501+ = 8 gallons or less. The biggest question is what ZeroWater does treat and what it does not (or cannot) treat for. Other things to note is what Zero Water claims it can treat, versus what it as been certified (by a lab, in this case NSF International) to treat. Floride - not certified to reduce fluoride, though it is an inorganic compound and usually exist in water between 2 to 4ppm (displayed as 002 to 004 on the water test meter). So if the filter reads 000, its not likely fluoride is present in the water. Uranim - the filters contain material commonly used to treat uranium, but no filtration lab has agreed to handle elevated levels of ranium. Chloramine - internal test show a reduction, but the presence of chloramine will reduce the expected life of the filter. Bacteria - does not reduce. Oxygen - does not remove. I've use it primarily for drinking water, either out of a cup if I'm at home, or a stainless steel water bottle for when I'm out of the house. I've used it a couple of times for large pots of soup, I usually need to filter the pitcher twice, but that works out fine because I need the water to boil the water first. I have not been tracking how much water I can purify, but that number depends highly on how much 'Total Dissolved Solids' are in your source (tap) water to begin with. The more dissolved solids in your water, the faster your filter will be used up, and that makes perfect sense. 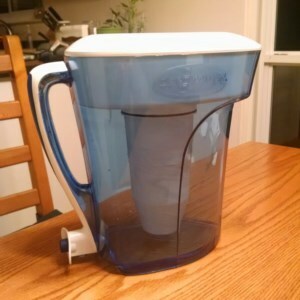 So unless you are planning on buying a built-in water filtration solution (such as reverse osmosis), I'd recommend the Zero Water Filtration System, and one more YouTube video called 'Vodka Filter Test: Brita vs ZeroWater Pitchers'. Do your own research and decide for yourself.